WikMail is an advanced email client program that handles all your email needs with style. 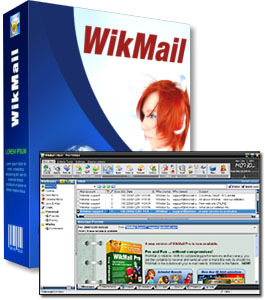 WikMail is fast, compact and stylized and easy to use. By using WikMail, your messages will look better than ever. WikMail Features included: Advanced Mail client and Mail checker, Unlimited mail accounts, mailboxes and folders, Direct access to mail servers, Anti-Spams, Anti-Phising and mails protections, POP3, IMAP, SMTP, WebMail compatible..
- POP3, IMAP, SMTP, WebMail (Hotmail, yahoo, etc...) compatible. - Embedded RssFeeds reader (like a mail account). - Diagram designer which embed resulting images in the messages. - Stationaries Builder, Macros recorder and Letter templates. - Custom colors for messages grid and preview. - Daily planner with month/days views. - Meteo with 6 days forecast. - Configurables international clocks with timezone and localization map. - Backup and restore tools. - Multi-threaded non blocking operations. - Multi-users with password protection. - Only one compact and fast executable. Qweas is providing links to WikMail 1914 as a courtesy, and makes no representations regarding WikMail or any other applications or any information related thereto. Any questions, complaints or claims regarding this application WikMail 1914 must be directed to the appropriate software vendor. You may click the publisher link of WikMail on the top of this page to get more details about the vendor.